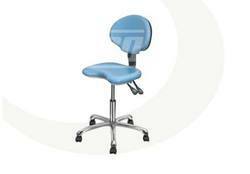 We are offering DX Surgeon's Stool to our clients. We are engaged in the manufacture of a wide variety of Revolving Stools, which is essentially used by laboratories and testing rooms around the world. Our Revolving Laboratory Stool is designed to offer comfortable sitting posture while doing sensitive research work and experiments. Jullundur (jalandhar) surgicals enterprises is the leading manufacturer, supplier and exporter of revolving stool / doctor stool / patient stool under its brand name je mediguard in delhi, india. 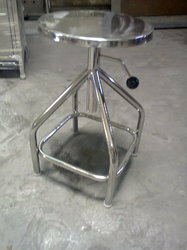 Banking on our enriched industry experience, we are engaged in offering a huge gamut of Medical Stools with Wheels. (1) SS tubular frame work & SS top. We are manufacture SS Revolving Stools and SS Fix Stool in SS 304 quality material and are widely used in pharmaceutical industries, laboratory , canteen, hospitals and clinics.